Last week I had the pleasure of presenting once again at the London @media conference, this time on the subject of Content Management. It was the first time I’d run that particular presentation, and consequently I’d like to have spent less time on the introductory material and more on the latter half, but on the whole it was pretty well received. I’ve put the slides up on SlideShare, but they don’t tell much of the story on their own. Therefore, I’m planning to serialise some of the main parts of the presentation as a series of articles, over at edgeofmyseat.com. The first of those is 8 Features to Look For When Choosing a CMS, and unsurprisingly runs through a number of things to take into consideration when you’re making your next content management system design or purchasing decision. Clearly, every project’s needs are totally different, so I’ve tried to focus on the main underlying features and attributes that should stand you in good stead for most projects. If you work with content management systems at all, I encourage you to check it out and leave any feedback in the comments here. I hope to have the next article together and published early next week, so you may wish to snag the edgeofmyseat.com RSS feed if the subject interests you. Apart from delivering a brand new presentation (which is always a bit nerve-racking) I thought the conference was absolutely terrific this year, and for me struck a really good balance between design and development topics. As a developer, I’ve found in the past that there was often more on offer on design topics, but this year there was plenty to catch my interest. I’ve posted a set of photos I took over on Flickr. This remains my favourite ‘big’ conference, and I’d really recommend it – @media Ajax makes a welcome comeback after the summer. 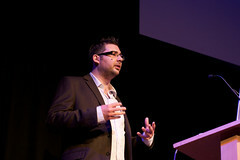 On the subject of conferences, my favourite grass-roots event dConstruct returns for a fourth year, again in September. Registration opens on 17th June (two weeks from today) and often sells out quite quickly, so book early to avoid disappointment, as they say. Thanks for the slides and the first article of this very interesting series! (Is the video/mp3 posted anywhere?). Just one question: from a security standpoint, do you consider that building your own CMS is a better idea? There are problems with building your own CMS, namely, it may have a security problem that you may never discover. When you go with a popular CMS, there is a good chance that hackers will exploit your website, but on the good site, you can always get new patches to reduce the vulnerability of the system. Do you think that Wordpress is a good CMS? @Natalia: You’re right that using a popular CMS brings with it frequent security patches, but it also brings a vector of attack. If you’re using a custom CMS it may well have flaws, but they would require effort to uncover – and effort that needs to be directed specifically at your site. As long as your CMS isn’t blatantly flawed, your site is far more likely to be compromised via a more common element in your stack such as an SSH bug or similar. They say ‘security by obscurity’ is not security at all – and that can be true. However, you can’t escape the truth that if there are publicly known flaws in the system you’re running it’s super-easy to exploit them. @Kamil: I think WordPress is a terrific CMS, yes. Just be careful not to push any CMS beyond its capabilities.